Working to clean up hazardous materials, drug labs and other dangerous sites isn’t a career choice a lot of people would make. However, for Dean and Jeanette May it was a natural progression from Dean’s career as a hazardous materials technician. 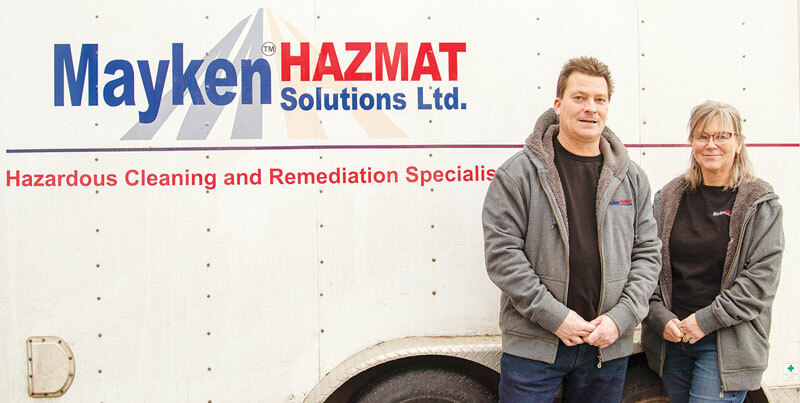 “I’m a spill specialist,” said Dean, who started his career remediating hazardous industrial and commercial material spills. “Any kind of clean-up you don’t want to do, we will,” said Jeanette. The initial idea was to expand what kind of hazardous materials they worked with. Until a call came in asking if they could clean a grow-op house. “Sure, why can’t I clean up a grow-op, I can clean just about everything else,” said Dean. With the appropriate certifications and training cleaning grow-ops quickly became a niche service offering. “Bad tenants, hoarding situations, grow-ops, mouse infestations and stuff like that,” he said. With the opioid crisis on the rise, Dean and Jeanette diversified again specializing in cleaning up drug labs and properties contaminated with fentanyl. Given the potential danger of the job, Dean said that it is the challenge that keeps him in the industry. ” I like the challenges, no two jobs are the same, everything’s different all the time,” he said. He also likes the people component. To be able to help people looking for guidance on dealing with the crisis that’s led to the hazardous clean-up. “People phone us frequently unsure of how to handle a situation and who to turn to, we can deal with that,” he said. When the couple get some time away from the job, a rarity since they work from their home, they like to be out camping. “During the summer we like to do half day Fridays, book out at noon, and steal away for the weekend,” said Dean.